This must be the week of great free music. First Vijay on sunday, then Christian aTunde Adjuah on Tuesday and then last night the Bad Plus performed a free show as part of Lincoln Center’s fabulous ‘Lincoln Center Out of Doors‘ series. 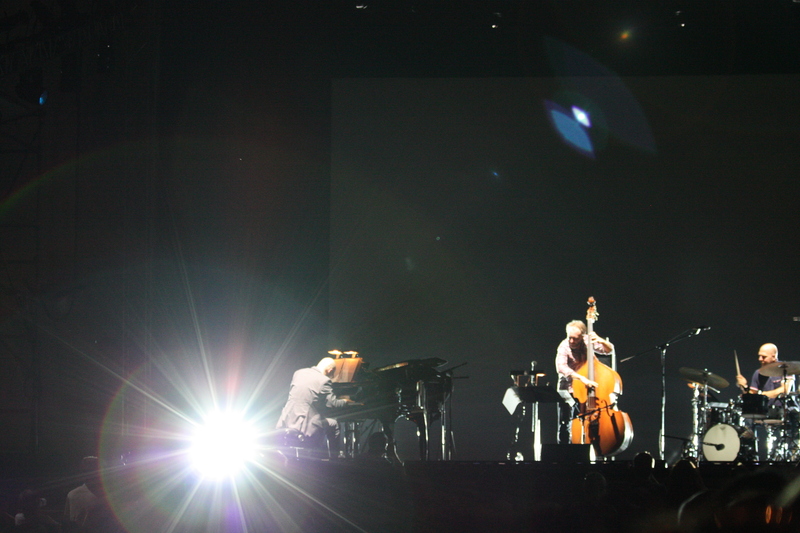 The centerpiece of the Bad Plus performance was their ambitious take on Stravinsky’s ‘The Rite of Spring’, which they title “On Sacred Ground”. This was a piece commissioned by Duke University and until now never played before in New York. I think it goes without saying that it was a fascinating show. Apparently, many people agreed with me. The Damrosch Park Bandshell was packed, with maybe 2000 people sitting and more standing in the back. Opening up the festivities was the American debut of the German Brandt Brauer Frick Ensemble. Their music read something like a modernist classical composer’s take on club electronic dance music. It was beat heavy with a drummer and a handful of percussionists going steady and with Moog synthesized bass sounds rounding out the incessant bottom end. At center in each piece was the piano, generally playing a repeated pattern or groove. Over that were clever, sparse touches of string, brass and harp. As an aesthetic choice and experiment in genre melding it was fascinating, if not necessarily the sort of music I would choose to listen to every day. A few photos of their setup (as well as the photo gallery for the Bad Plus) can be found here. More on the Bad Plus after the break. The Bad Plus started out with three of their original songs to kill a bit of time. Their ‘Rite of Spring’ was accompanied by visuals by Cristina Guadalupe and Noah Hutton, which took the form of video projected on a screen behind them as well as the lighting changes. The visuals work best with darkness, so while they waited for the sun to finish setting, the Bad Plus played a few songs, including Dave King’s relatively new ‘Wolf Out’ which is always a joy. Then the rites began in earnest. Tackling the Rite of Spring is the perfect Bad Plus project. A complex, thoroughly modern work and robust to the point of being able to handle whatever the band wants to throw at it. It also takes a beat well, as it turns out, an experiment they have tried before with another Stravinsky composition, Variation d’Appollon. The Rite of Spring is a much more rhythmically active composition, however, and I think much better suited for Dave King’s kinetic style of drumming, which sounds sort of tacked on during the Variation d’Appollon to me. I know this can’t be the case, but listening to the Bad Plus play through “On Sacred Ground” it was hard for me to believe that “Rite of Spring” wasn’t composed with them in mind. Musically their take is tight, as tight as any of their own compositions. The jarring hits during the ‘Augurs of Spring’ section of the work (right after the introduction) sounded frighteningly good in the band’s hands. This speaks to both the original composition but also the Bad Plus’ compositional and arrangement prowess. The visuals as well were very successful. The piece actually started out all visuals, the band un-illuminated with video and the introduction pre-recorded playing. The band came in immediately following the introduction and was accompanied by a major shift in feel as the lighting and color changed completely. Over the course of the show the feel of the stage would change multiple times: different colors would dominate, different images would be displayed behind, and sometimes video. The photo that heads this post was taken immediately after a transition from a moody color: the plain white lights came on including two bright spots aimed straight into the audience. That was a pretty cool moment. The last portion of the work, which in the original ballet was about the sacrifice dancing herself to death in this bizarre pagan rite, is accompanied by blurry, artistic type video of a woman dancing. I won’t pretend I really understood the visuals necessarily, but as an overall experience I do think they added to my enjoyment of the show. Again, please see the gallery here for an idea of what the show looked like, bearing in mind that it would be hard to capture every interesting thing that went on from where I was, at night. “On Sacred Ground” was great, and I hope they release it at some point, or give us more opportunities to see it live. It would be hard to package the whole experience, I recognize, but I find myself wanting to revisit the music already.